SMART DESIGN – Measures approximately 15″ X 9″ inches. Subtle pan grade slope directs grease away from the food. 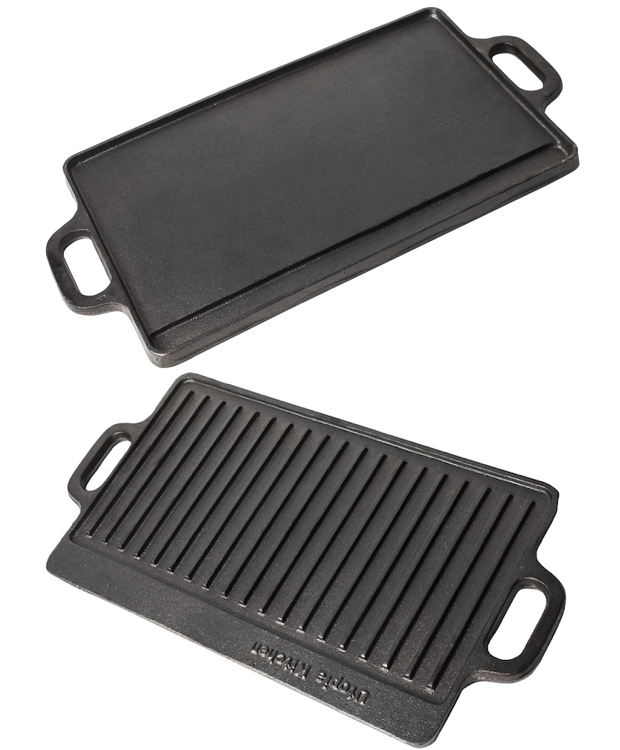 This Reversible Griddle is meticulously designed to serve you for years and decades to come. – Specially designed side grip handles provides safety and convenience. Easy to transport. VERSATILE – Reversible grill/griddle is made of cast iron for fast, even heating. The possibilities are limitless when it comes to what you can cook on griddle. You can make Pancakes, French toast, Burgers, Steaks, kebabs and sausages, chicken, marinated fish, seafood, fresh fruits and vegetables. FORTIFIES YOUR FOOD WITH IRON: While cast iron doesn’t leach chemicals, it can leach some iron into your food and that’s a good thing. Iron deficiency is fairly common worldwide, especially among women. Cooking food, especially something acidic like tomato sauce in a cast-iron skillet can increase iron content, by as much as 20 times. MONEY BACK GUARANTEE: We think you’re going to love this Griddle as much as we do! But in case you don’t, you are covered by our 30 day, no questions asked, money back guarantee. We want our customers to be 100% happy. QUICK USE AND CLEANING – Pre seasoned and ready to use. Cooking on the griddle or on a flattop grill is a good alternative to have fun with cooking healthy, quick and dietetics. It involves grilling all kinds of food on a hot plate that has been greased with very little oil or without any fat at all. Foods are not fried but baked in their own juice. It eliminates all risk of burning that one can have with a traditional barbecue and retains all the benefits of food. To clean cast iron, never use soap. Simply scrub your skillet with a stiff brush and hot water and dry it completely.